The eldest son of Antoine-Jean Bail, a painter from Lyon, Franck-Antoine, like his father and his younger brother Joseph, painted genre scenes, still lifes, landscapes from the region around Fontainebleau. He also completed portraits for which he gained a solid reputation. He studied with his father Antoine-Jean Bail (1830-1918) and in the atelier of Jean-Léon Gérôme, and began exhibiting at the Salon des Artistes Français in 1878. He received an honorable mention at the Salon in 1889, a third class medal in 1900, and a second medal in 1904. Perhaps not as well known as his brother Joseph, his reputation is nonetheless well established among the genre painters of the latter part of the nineteenth-century. 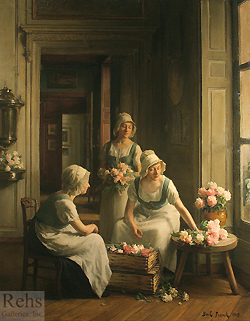 Similar to Théodule Ribot, his daughter Louise and son Germain, another family of 19th century realist painters, the Bails worked in Paris where they had studios on the Isle Saint Louis. The first, at 17-quai d’Anjou in the hotel Lauzun, had a spacious kitchen that served as a wonderful background for the Bails’ paintings of cooks, scullions, and copper ware cleaners. When not in Paris, the three artists moved to Bois-Le-Roi near Fontainebleau, where they spent their summers and found other subjects for their canvases, namely studies of the forest of Fontainebleau or genre scenes representing rural themes.